Cops and Headlights is based on a series of paintings and drawings that were executed by the artist in 1991. Original hand-pulled silkscreen printed in seven colors (water-based screen inks) from seven screens, a fine, fresh impression of the only state, the full sheet, printed on BFK Rives white to the edges, hand-signed, dated and numbered in silver pencil by the artist, from the edition of 90 examples (the total signed edition includes 11 artist’s proofs numbered AP1/11 to AP11/11, 3 printer’s proofs numbered PP1/3 to PP3/3, 6 hors commerce proofs reserved for the publishers and not available for sale numbered HC 1/6 to HC 6/6, 1 BAT proof, annotated, reserved for the archives of the printer and 1 state proof, annotated, which is also not for sale), printed by Rand Russell of Grin Graphics, New York, published by Donald Taglialatella in conjunction with Gotham Editions, New York (now defunct) in fine condition, framed. 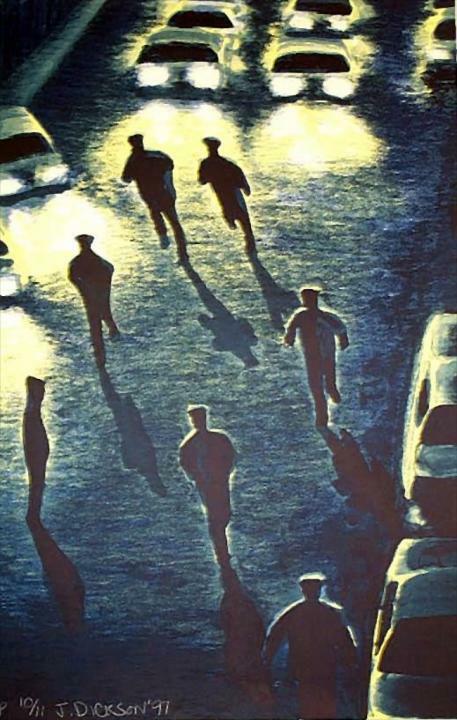 Cops and Headlights was published by Donald Taglialatella in conjunction with the now defunct Gotham Editions, prior to the formation of World House Editions.